With every company I analyze, I try to find those one or two characteristics that make it unique. Some feature that, for better or worse, makes it different from the rest. At Carnival Corp. (NYSE:CCL), the key differentiator is its massive profits. Due in part to its market share leadership (~47% share of cruise passengers) of a profit-rich (and tax-free) industry, Carnival is the most profitable company within the broader lodging sector. Consider that in its upcoming Q3-18 (Aug.), CCL should generate close to $2 billion in income. Thats about what Marriott Intl, lodgings third most profitable company (after Royal Caribbean), earned over the past two full years (net of one-time items). Yet net profit is just a number though a very big one at CCL. Outlining what Carnival does with these profits and, more importantly, the significant resulting cash flows to ensure their sustained growth is the point of this article. Lets begin by looking at the companys balance sheet, the facilitator for future growth. 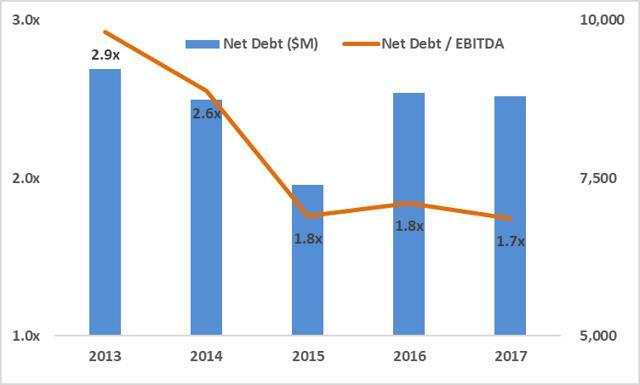 Still easily the cruise industrys most conservatively capitalized operator, net debt began this year at just 1.7 times EBITDA. Even as borrowings have fallen by nearly 陆 billion dollars since 2013, operating cash flows have climbed some 60% these past four years. Sources: SEC filings, SMR estimates. Over this span, Carnivals returned about $8.5 billion to shareholders, through dividends and share buybacks, while funding guest capacity increases of 2.7% annually. In this capital-intensive industry, Carnivals A- debt rating (S&P senior unsecured), and favorable borrowing costs (around 2.25%) put the company in a formidable position to fund the accelerated expansion thats set to begin in 2019. 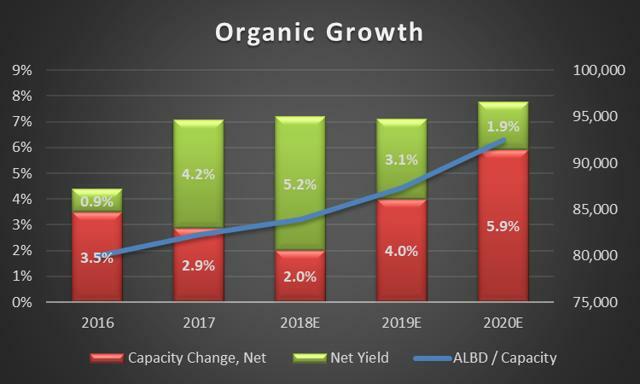 For now, though, the bulk of Carnivals organic growth will arise from continued improvement in net yields per-berth changes in revenue after key variable costs (e.g., travel agent commissions, onboard, etc) the industrys benchmark for organic demand. Rising more than 8% (+4% ex-currency) in Q1-18 (Feb.), CCLs net yields have begun 2018 at a pace of improvement that exceeds even last year’s jump. My forecast of +5.2% for all of 2018 is slightly below the usually conservative guidance (+6.0% reported, +2.5% constant currency) provided by management in mid-March. This year the company will net just one new ship put into service with most of that new capacity coming in Q4-18 (Nov.) after the agreed sale of two older vessels. But then in 2019, capacity growth will accelerate from the launch of four new ships (Sky Princess, Venezia, Panorama, Smeralda). The capacity increase of 4% estimated for next year assumes that these new boats effectively replace one- or two older, smaller ships it sells annually the pace for Carnival these past few years. My forecasts for future internal growth at Carnival partly reflect relatively buoyant demand for cruising, where global economic growth provides continued tailwind. Favorable demographics including rapidly growing wealth and greater discretionary spending in developing markets combine with improving economies across most of its core, developed markets (e.g., US, Germany, UK). Even in these affluent countries, less than 5% of the population has ever taken a cruise, providing potential demand for decades to come. At the same time, Carnival is executing on internal initiatives aimed at fueling growth over the longer-term, through improved yield management systems, new boat deployments (e.g., Bahamas, Cuba, China), and novel marketing channels (e.g., original show programming), to name just a few. Operating leverage from higher yields will continue to be the main driver for further improvement in margins and profitability at the company. And even though a stronger dollar and more costly fuel will impact reported revenues and profit (margins) this year, the company has hedged much of their potential effects. Among its Boards highest priorities continues to be returning a sizable chunk of ongoing profits in the form of dividends. Following three hikes in just the past 15 months, Carnivals annualized payout now stands at $2.00 a share, a forward yield above 3.0%. Absent any change in the share price (at $64, now firmly below levels to start 2018) dividends should remain around the current quarterly figure through next year. As Carnival’s dividends trend toward the low end of its stated 40-50% payout, expect further acceleration in its share buyback. Look for total share repurchases in 2018 to approach the $1 billion (>2% of equity) authorized (>2% of equity) in April, followed by a similar scale of buybacks in 2019. By fiscal year-end 2019 net debt should rise to only about 2.0 times EBITDA (vs. 1.7x in 2017), before factoring in the benefit of up to $400 million in annual adjustments implied in managements recent outlook (and recorded in past years). A DCF-based analysis works for Carnival, given its relatively mature profile and comparatively predictable future cash flows. On this basis, I arrive at intrinsic value of about $78, suggesting better than a 20% return (before its 3% dividend yield) from recent quotes. 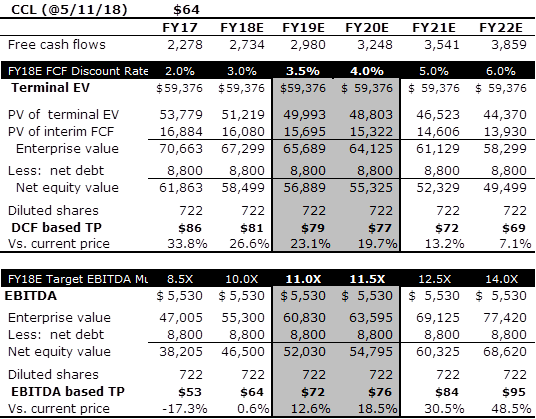 DCF, of course, has its limitations: mostly its sensitivity to ones assumptions, where I use a range of discount rates and a five-year growth rate of about 10% in free cash flows (based on maintenance capex). Despite its shortcomings, DCF provides a good theoretical backing. But for practical reasons, I place a bit more weight on relative valuation measures, namely EV to EBITDA. 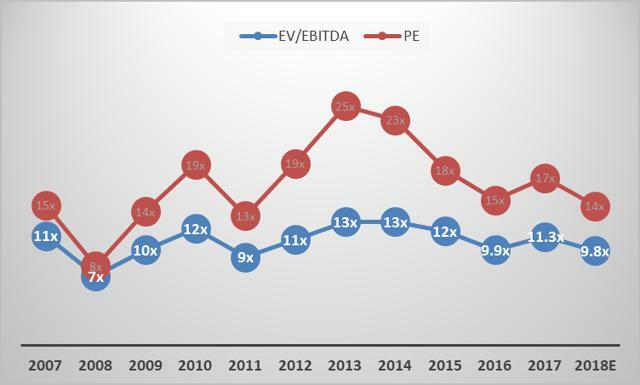 Since the top of the most recent cycle in 2007, EV / EBITDA has been steadier and thus more reliable than PE. That should come as no surprise. Therefore, I use EV / EBITDA as the main comparative valuation measure for CCL. The 11-11.5 times recommended multiple to EBITDA below is about in line with historical (i.e., year-end, backward) valuations, even though I think underlying growth, and its predictability, have only improved. 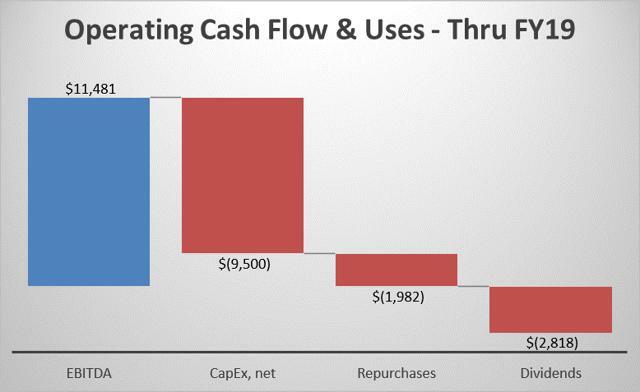 On the assumption that the lodging cycle is in its latter stages, this predictability, or consistency, in Carnivals cash flows is increasingly important. Since the prior-cycles peak, the volatility (i.e., standard deviation) of Carnivals EBITDA, at 21%, is easily the lowest of the three major cruise lines also ranking it just below the worlds two largest hotel franchisers (Wyndham Worldwide and Choice Hotels) for the groups most stable cash flows. This factor, along with its superior balance sheet, help merit CCL a lower discount rate and a higher multiple on future cash flows than its main cruise rivals. Based on (unadjusted) EBITDA, I arrive at a one-year target price for Carnival in the mid-$70s, implying low- to mid-teens appreciation from recent quotes. Finally, some investors may prefer valuing the company based on the massive profits I spoke to at the start of this article. 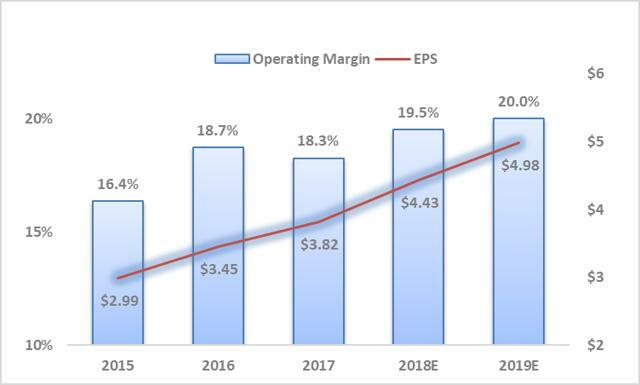 On this basis, applying the overall markets multiple of 18.0 times to my 2018 estimate for CCLs share earnings ($4.43), results in an $80 target price, even though CCL offers superior long-term growth and a much higher dividend. Disclosure: I am/we are long CCL. Additional disclosure: This article is not a recommendation but for information purposes only.